Android now represents one of the chief threats to the iPhone. Although iPhones had a head start and still draw huge lines when new models go on sale, Android devices sold twice as well in the second quarter. According to Gartner, Android's market share grew 2 1/2 times to 43 percent, compared with 17 percent a year earlier. The iPhone's grew as well, but by a smaller margin _ to 18 percent, from 14 percent. He was a junior graphic illustrator when he got the client of a lifetime. Mac's easy-to-use interface and its mouse controller, for instance, came out of Xerox Corp. But in 2008, a year after the iPhone came out, Google unveiled plans to release Android as a free software system that phone makers can use to make devices that compete with the iPhone. Jobs was so infuriated that he went to Google's Mountain View headquarters about nine miles from Apple's Cupertino office to try to stop the project, according to the biography. 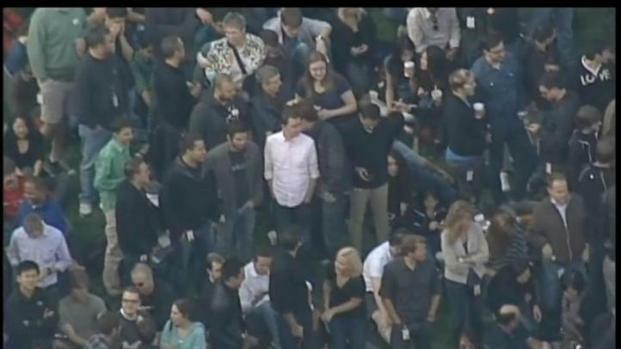 Hundreds of Apple employees gather outside Apple's company headquarters for a employee-only memorial for Steve Jobs.